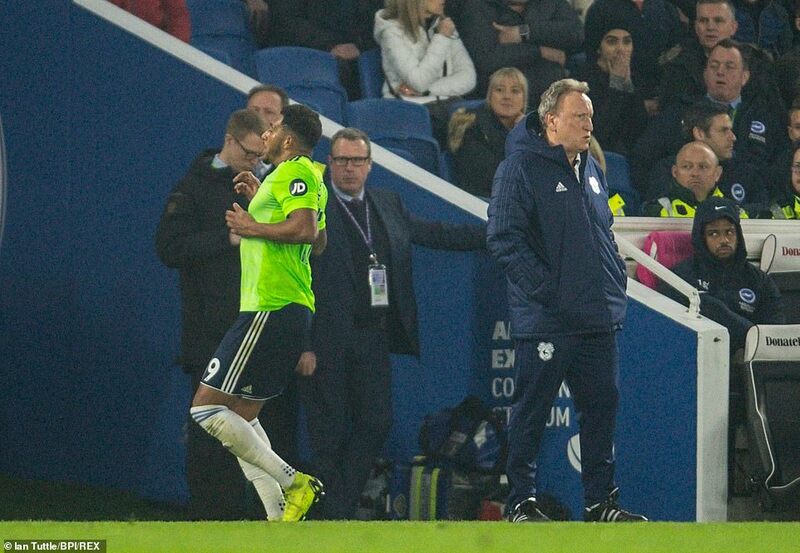 Neil Warnock had called for a comeback in the style of Tiger Woods. What he got on an evening of renewed hope was something he considered far more unlikely — a penalty decision in his favour. Not just a small one, either. It was a biggie. So significant, perhaps, that when the scrapping is done, it might just trace back as the key moment if Cardiff pull off a great escape and Brighton succumb to a great collapse. That is because for all the world it appeared Brighton should have had a penalty at 0-0, 10 minutes in. Bruno Manga had his hands all over Lewis Dunk at a set-piece, clear as day, and when Dunk hit the deck, it was with no little force. It was a pull and a pretty hefty one, but unlike against Chelsea at home and Burnley away, this one went for Cardiff. The move for the first Brighton goal scored by Nathaniel Mendez-Laing. For more stats visit the match zone. 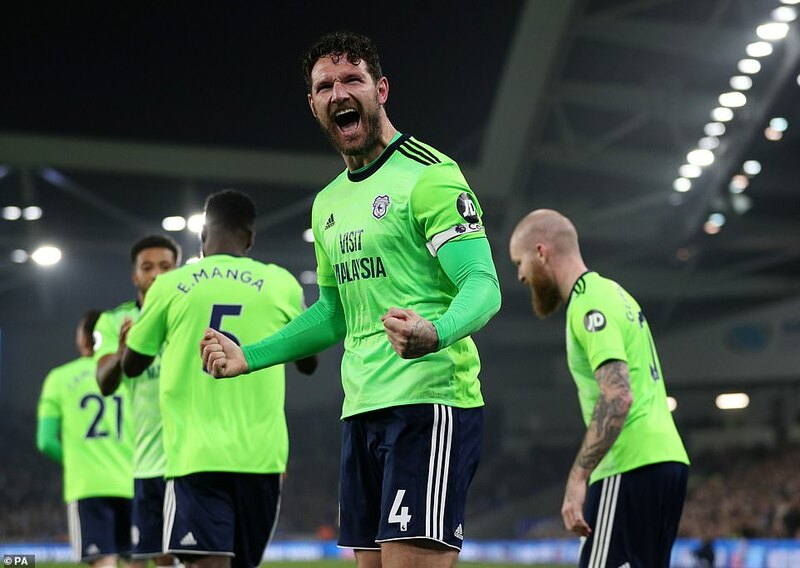 They say these calls even out over a season; this call might have saved Cardiff’s, given it was the platform from which Nathaniel Mendez-Laing scored a beauty for 1-0 and Sean Morrison got the second goal for security. On that front, consider how unusual it was for this team with six defeats in their previous seven games to score twice. 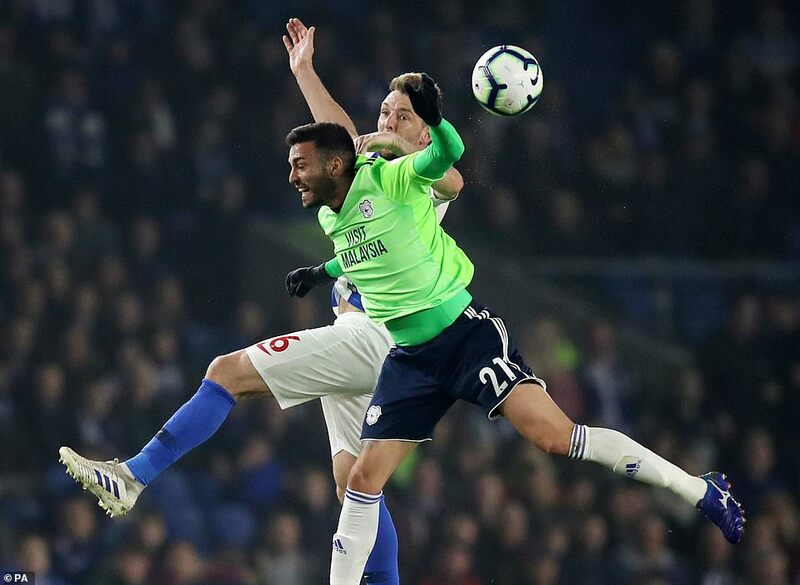 Cardiff previously had scored only nine away goals all season and last won a top-flight fixture away from home by two goals in 1956, when Warnock was seven. Fine timing to get it so right on a night when defeat would have meant near certain relegation. Instead, they can see the faintest of gaps between the branches and the ball is just about visible in the thick rough. They are two points down on Brighton, who have a game in hand, but that is a night-and-day difference to eight, as it would have been had they lost here. ‘So many pundits this morning said it would be our last game in the Premier League but we’re alive and kicking,’ said Warnock. Brighton position somehow feels no less perilous, partly because of their form — 12 points from a possible 54 — and also because each of the two clubs has a horrible run-in. 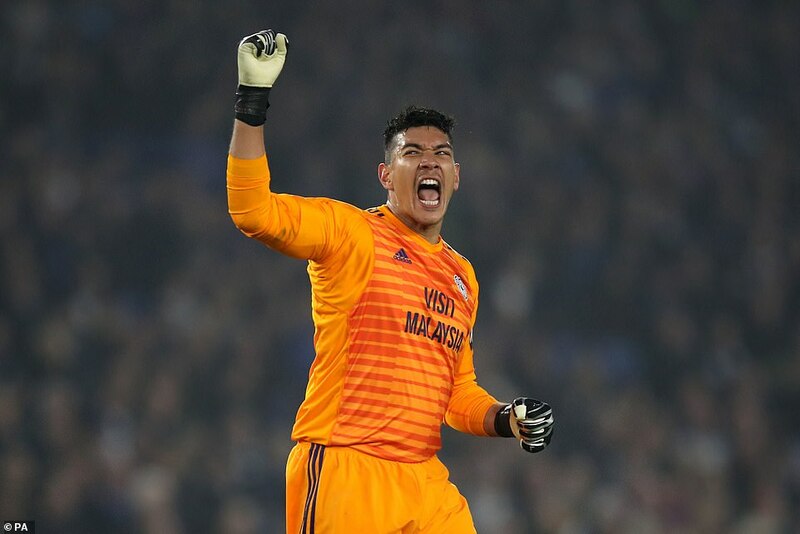 Cardiff face Liverpool, Fulham, Crystal Palace and Manchester United, while Brighton are up against Wolves, Tottenham, Newcastle, Arsenal and Manchester City and have just suffered a fifth straight defeat in all competitions. It’s their worst run in 12 years — less than fine timing. Warnock, for his part, just about agreed, but felt his side were denied one of their own. Some things will never change. On Brighton’s predicament, Hughton added: ‘As a team, as a club, and as individual players, there is only one way we can ensure we stay in this division: that’s by fighting as hard as we can, making sure that, if we’re not able to score the goals we need, that we’re not conceding. The urgency of Brighton’s situation was conveyed in Hughton’s team selection — five changes were made to the side trounced 5-0 by Bournemouth. Warnock made three to the one beaten at Burnley and will feel a degree of satisfaction from two of them — Joe Ralls and Mendez-Laing — being key to the opening goal. It was Ralls who ended a Brighton attack with a firm challenge in his own half and then sprung the counter in which Junior Hoilett surged down the left and played in-field to Mendez-Laing. After a couple of touches he curled from 25 yards into the top right corner. For a team that has often been accused of lacking grace, it was a lovely looking goal. 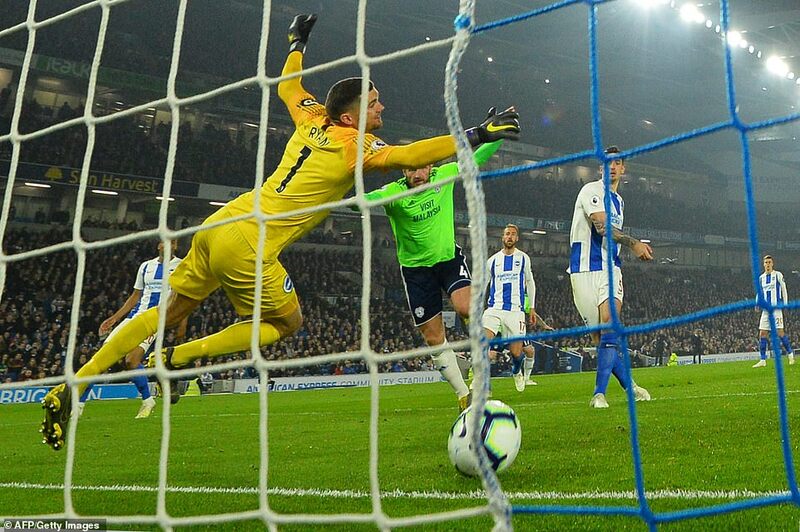 Brighton missed several chances before the break and then went 2-0 down at the start of the second half, when poor marking by Dunk left Morrison free to head in a Victor Camarasa free-kick. Cardiff have found some hope. Brighton find themselves in the long grass.